Curl up with a good book and relax ! All you need is some suncream ! 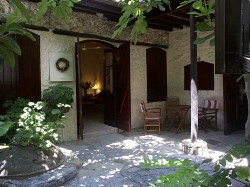 Kantara House is situated in the centre of this totally unique, traditional ancient Cypriot village. 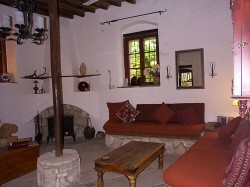 Approximately 250 years old, this house has original wooden beamed and cane ceilings and is ideally placed for those looking for a peaceful quiet location yet only 20 minutes from Limassol's beaches, shopping, historic sites and only 20 mins to the cool mountain breezes of the Troodos Mountain range . 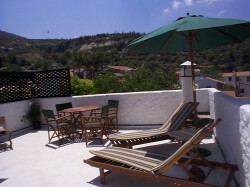 Furnished and equipped to a high standard, guests return each year assured of a comfortable stay in an ideal location. Kantara is extremely private . Once you close the garden gate you are totally secluded within the traditional yard garden, filled with colourful geraniums, chairs to relax in and tables to rest your wine. The spacious lounge with wood burning stove is ideal for relaxing on cooler winter evenings while appreciating the peace and quiet of village life, thence leading into the exceptionally well equipped kitchen. A spiral staircase from here reaches to upper floor and the very large bedroom with ensuite toilet also accessed from outside stairs. 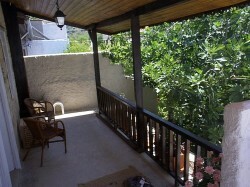 From here large double doors open onto the balcony and roof terrace. Open in the morning and look out from your bed with tea in hand taking in village life, and the glorious views of the surrounding hills and brick coloured roof tops. Enjoy the clear mountain air, the local fresh produce, visit the many micro wineries nearby.The village boasts delightful galleries and craft shops. Nearby there are an abundant attractions. Theatres ancient and modern, historic churches,museums, monasteries, ancient sites such as Curium, Kolossi and Limassol Castles, golf coures, waterparks, cinemas . Lania is central to both Paphos and Larnaca where there are even more ancient sites. It is only 1hr from both airports and is easily accessed by mainly dual carraigeway Clear instructions will be sent prior to your arrival to access this little treasure of a house where returning guest's enjoy theitr holiday assured of high standards and excellent qulaity accommodation. After 14 years of providing selfcatering in Scotland and Cyprus we know what the customer requires and if we don't meet your requirements we would like you to tell us !!! We look forward to providing you with a memorable holiday in a real home from home with stylish surroundings furniture and decor. To be fair to those who cannot take a holiday outwith the high season the same weekly rate will apply throughout the year. Extra days are charged pro rata. Start and finish days flexible. EG. Arrive Sunday depart 10 days later on Tuesday.